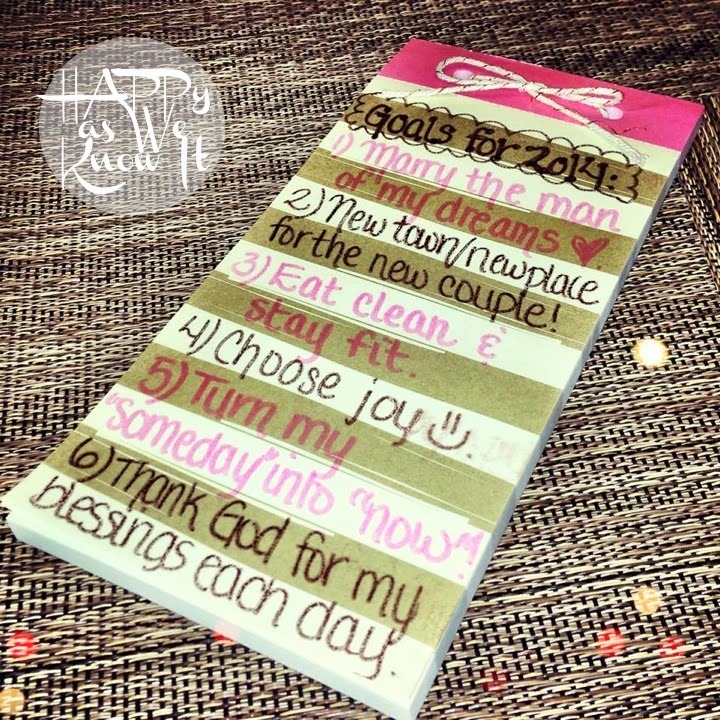 At the start of this new year, I took some time to reflect and think about what I truly want to accomplish during 2014. I already knew this year is going to be a year full of big life changes, new beginnings, and what I hope to be beautiful memories. But along the way, I want to make sure that those big things (and the stress that can sometimes ensue from planning them) don't overshadow those goals that I need to strive to accomplish daily to improve upon myself as well. Thus, keeping these thoughts in mind, my list was compiled. 1.) Marry the man of my dreams. I cannot wait to marry my handsome Mr. Happ this summer. I feel like the luckiest girl in the entire world to be able to spend my life with my best friend. I thank God each and every day for this blessing. 2.) New town/New place for the new couple. Ryan and I have decided not to live together before we are married. Thus, we are beyond excited not only to be husband and wife, but also to find a new place to call our own where we can start building our lives together. Where we'll end up? - Stay tuned. 3.) Eat clean and stay fit. I have really gotten into trying new recipes, new workout regimes and leading a cleaner healthier lifestyle over the past year. I want to make sure that I continue to do this not only to fit into that goal #1 wedding dress, but because the body, mind and soul are all interconnected. In taking care of my body and physical health, it will in turn, positively impact those other aspects of my life as well. Amidst wedding planning, planning for our future, working full time, working out, cooking, cleaning, blogging...you know the drill...life gets really busy, and all too often alongside all of the craziness come these feelings of being stressed and overwhelmed. While I have my moments, I am truly trying to focus on choosing joy and seeing the opportunities for joy that each of these 101 things I feel that I need to accomplish each day bring. Let's be honest, when I choose joy, I tend to get all of it accomplished more efficiently, effectively, and en-joy-ably. 5.) Turn my "someday" into "now". We had a wonderful sermon at our church at the beginning of this year about turning our "somedays" into now. All too often, we tend to put off those things that we know we "need" to do, but that might require some effort or change on our part. Not this year. Adios procrastination. This year, is my now. 6.) Thank God for my blessings each day. God is good, all the time. He has given each of us this beautiful life we have and bestowed upon us countless blessings. Thank you God for blessing me much more than I deserve. Now, while I like keep these six lofty goals hanging up for review as needed, I also find it helpful to keep constant, refreshing reminders of how I can work to achieve them each and every day. Around my home, in places like my bathroom mirror, nightstand, refrigerator, outside door, etc. 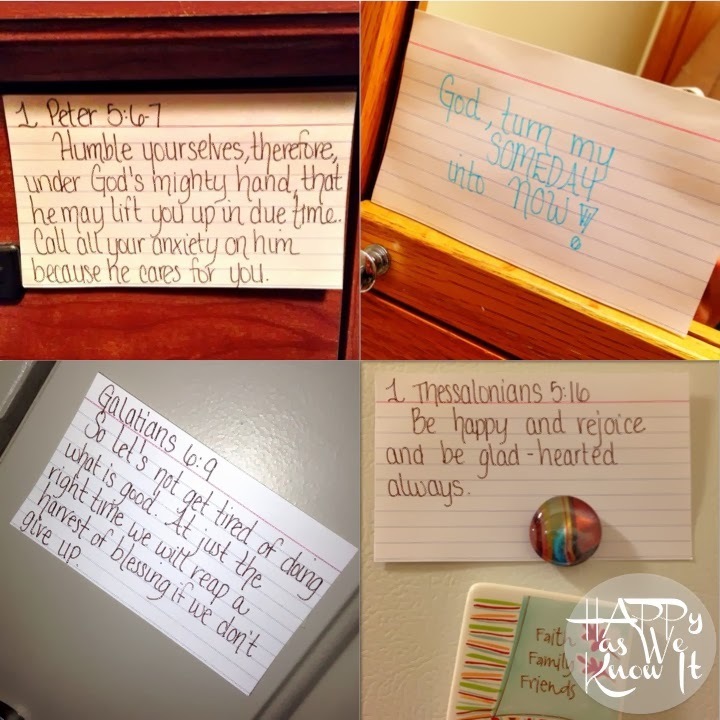 I have put notecards with scripture and ideas that inspire me and remind me of the "me I want to be" during this year and beyond. I encourage you to write them down, share them with others, and find other ways that work for you to hold you accountable for them. Turn your "someday" goals into "now" ones :).